A deceptively twisty set of circumstances brings us a riveting story that is ultimately about love, redemption and family in multiple configurations of that combination. 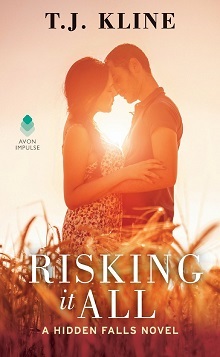 Andrew has changed over the years after a broken heart – now closed off and determined to not let anyone under his skin, and then Gia returns after a long absence. Coming back to Hidden Falls was not really in Gia’s plans, she left in a rush after her engagement to Andrew was, she thought. Completely ruined. Planning to put the experience and her sister in her rear view mirror, she’d been going against type: always the reliable child, no one expected her to run. But, now with her father ill and the business needing her, she’s back with one very unusual addition – a baby. The interplay between Gia and her sister Lorna is just gripping: always the troublemaker with no sense of responsibility, Lorna caused upheaval when the girls were younger due to her spitefulness. Now, relying on Gia to follow form and do what is right, she’s left her baby with Gia, and disappeared again. So Gia and the baby Bella leave San Diego and return to Texas, and Gia has two things on her mind: her father and his illness and repairing the damage in her family that Lorna very clearly causes and fuels. She’s not interested in Andrew –seeing him, talking to him, even accepting the apology that she feels is overdue are not on her to do list. And then – she and Andrew are just as electric and compatible as before, with plenty of moments where he goes the extra distance to convince her that they are meant for one another, no matter what. There shouldn’t be more difficulty for the two of them – but of course, things happen and Andrew is again finding himself in a precarious position. Much could have been solved earlier had Gia been honest about why she left in the first place, and who knows if she wil ever open up and really share with Andrew And of course, there is Lorna’s influence and part to play in this story both with her jealousy of Gia and general need to disrupt her happiness and the fact that she dumped Bella, expecting someone else to raise her while she continues to bulldoze her way through life and her family. A wonderfully complex story that will have you cheering for Andrew and Gia, adoring the baby Bella, and wanting to find a large mallet to whack Lorna about the head, repeatedly. Full of growth, compassion, those situations that only family can place you in, and how you choose to react when you discover that with love, patience and someone on your side no matter what, all things are possible.